AD Coach House Cottage in Fremington, near Richmond, Yorkshire sleeps 6 people. 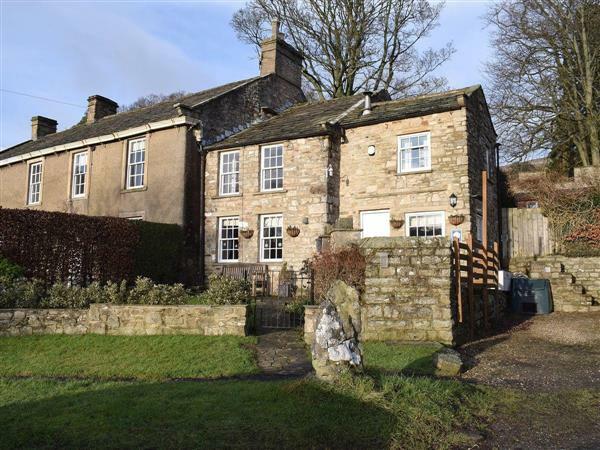 AD Coach House Cottage near Richmond is a traditional, semi-detached, stone built, 17th-century Grade II listed cottage in the hamlet of Fremington, just ¼ mile to the popular Swaledale village of Reeth. Combining a mixture of original features including beamed ceilings, Yorkshire stone flooring and a multi-fuel wood burner, with contemporary furnishings to create an ambience of comfort, character and charm. Whether sitting outside with a refreshing drink or snuggling up in front of the multi-fuel burner, A D Coach House Cottage is a perfect all year round retreat for exploration and relaxation. This cottage commands wonderful views across open farmland and the dales beyond, and is perfectly situated for discovering all north Yorkshire has to offer. The Yorkshire Dales offers many activities, walking and cycling routes on the doorstep. The cottage also provides two bike locks on the wall in the driveway. A D Coach House is an ideal holiday cottage for families, couples and groups of friends looking for a relaxing or action packed holiday or a short break. There are many varied walks from the doorstep including one which passes through the ruins of Marrick Priory and the Nuns’ Causeway, leading up to Fremington Edge. The villages of Grinton and Reeth are just a short walk away, and the lovely old market towns of Leyburn and Richmond also within easy reach. Take in some of the Wainwright’s Coast to Coast walking route, drive east into the North York Moors National Park or west to the Lake District National Park. The surrounding north Yorkshire countryside truly is a walker’s paradise, with in excess of over 6000 miles of public rights of way that wend up hill and down dales through Areas of Outstanding Natural Beauty. The property is in the perfect location to enjoy the wider area and visit one of the many pretty Yorkshire towns and villages, such as Thirsk, Ripon, Yarm, Pickering, Hawes or Middleha,, all of which are close by. There is the opportunity for fishing at Brompton Lakes, which is just over 12 miles away, or you can watch the horse racing at Catterick and York racecourses. The cathedral city of Durham is just over half an hour away to the north of Richmond, and is certainly worth a day trip to explore, as is the medieval walled city of York with its wealth of visitor attractions. Richmond is perfectly situated for those wishing to explore both the outstanding natural beauty of the Yorkshire Dales National Park and the North York Moors National Park. The shop, pub and restaurant are all ¼ mile from AD Coach House Cottage near Richmond. Ground Floor: AD Coach House Cottage has a step to the entrance. Living room: With multi-fuel burner, 32 Freeview TV, DVD player, CD player and stone floor. Kitchen: With electric oven, electric hob, microwave, fridge/freezer, washing machine and stone floor. First Floor: Bedroom 1: With four poster double bed and beams. Economy 7 heating, electricity, bed linen, towels, Wi-Fi and fuel for multi-fuel burner included. 2 travel cots, highchair and stairgate. Welcome pack. Small enclosed garden and patio with garden furniture. Private parking for 1 car. No smoking. Holidays at AD Coach House Cottage run from Monday to Monday. Pets allowed at AD Coach House Cottage. For a better idea of where AD Coach House Cottage is, you can see AD Coach House Cottage on the map below. AD Coach House Cottage is in North Yorkshire; should you be on the lookout for a special offer, you can find all the special offers in North Yorkshire. It's always worth checking to see what is on offer at the moment. Do you want to holiday near AD Coach House Cottage (UK2375), you can see other cottages within 25 miles of AD Coach House Cottage; have a look to find your perfect holiday location.